During the course of our conversation, Tan Khoon Guan, FCA (Singapore), Managing Director, Precursor Assurance PAC, reveals a key facet of his keen intellect. “The trust that (Precursor) has built is something that cannot be compromised. We have to build on that trust and go beyond,” says Mr Tan, known even within the firm he founded as KG. The point Mr Tan was making relates to the foundation of trust that, in his opinion, must be established between chartered accountants and business leaders. Without this, accountants would not be able to work with any organisation. He recognises that this trust must be used to get to the “next level of engagement”, and shares Precursor’s expansion. He explains that for the firm, compliance services are just the start of a relationship with a client; this is why the firm continues to add competencies and services outside traditional accounting. A well-known figure in the accountancy scene, Mr Tan, 45, was most recently recognised at last year’s Singapore Accountancy Awards for the work of Precursor Assurance PAC, where the firm received the Best Practice Award in the Small & Medium Practice (SMP) category. The firm has also captured the attention of the media for its journey to constantly redefine its services and solutions by embracing technology. Founded in 2006, the firm, which was called K.G. Tan & Co. PAC until 2016, when it was renamed Precursor, saw Mr Tan embracing the bootstrap mentality, using his own passion for technology to learn how to code with Microsoft Access. He did this because he wanted to build an integrated automation software as there was nothing like it in the market. “We were quite small in the beginning. I didn’t have the budget to invest in anything, so I eventually took up a Microsoft Access book and tried to figure out my own solutions. I did come up with a simplified software developed via Microsoft Access in the end,” he shares. Mr Tan spent his nights coming to grips with Access on his own, working for six months just to get the results that he needed. This software was adopted by the firm internally, and was the seed of the company’s growth trajectory. 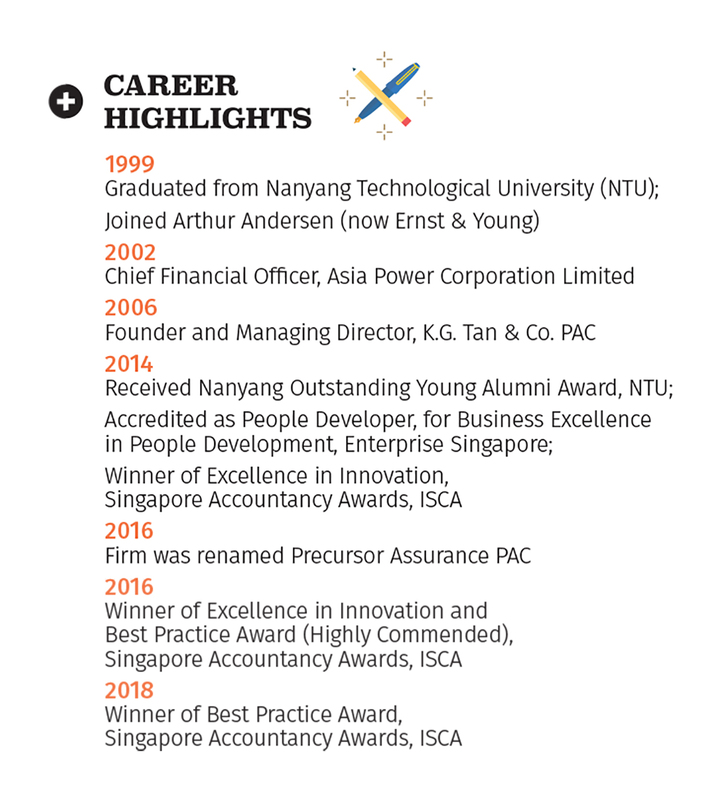 According to Mr Tan, in 2008, the firm was the first and only accounting firm to have developed a web-based practice management system that automated the entire workflow of its operations, while integrating seamlessly with accounts, payroll, customer relationship management and administrative functions. Today, Precursor’s technology services are powered by its own specialised development unit and offered to other SMPs. Called Precursor Technology, it comprises two teams based in Singapore and India. The SmartCursors Marketplace service that was launched at last October’s Accounting and Finance Show is just the latest chapter in a successful arc for the firm. Owning this arc was the main reason for Mr Tan to embark on his journey as a business owner. “I’ve always felt (in my past jobs) that my satisfaction levels hovered at a maximum of 90% because I needed somebody else to finish the job. I could not go further because I did not own the process. Now, I’m driving my own destiny and that’s really exciting!” he says. Laughing, he reveals that his 10-to-16-hour work days both motivate him to get out of bed in the morning and tire him out in time to hit the sack. So, how does he handle the issue of a work-life balance? “Balancing is always an art,” he explains. “You will not be looking at an equitable balance because something always has to give. Just remember that you don’t live in this world alone – you wear many different hats across your personal and professional lives.” He credits jogging, meditation and his family for helping him establish an ideal work-life harmony.